"We found there was no discernible benefit of aspirin on prolonging independent, healthy life for the elderly," says Anne Murray, a geriatrician and epidemiologist at Hennepin Healthcare in Minneapolis, who helped lead the study. But for older, healthy people, "the risks outweigh the benefits for taking low-dose aspirin," Murray says. The researchers stressed, however, that the cancer finding might have been a fluke. There's also a possibility that any colorectal cancer benefit wasn't seen because the subjects had only been followed for about five years. "A lot of people read, 'Well, aspirin is good for people who have heart problems. Maybe I should take it, even if they haven't really had a heart attack,' " Murray says. But "for a long time there's been a need to establish appropriate criteria for when healthy people — elderly people — need aspirin." That's why the researchers launched their study, called ASPREE, in 2010. It involved 19,114 older people, with 16,703 in Australia and 2,411 in the United States. The U.S. portion included white volunteers ages 70 and older, and African-Americans and Hispanics subjects ages 65 and older. "We were hoping that an inexpensive, very accessible medication might be something that we could recommend to elderly to maintain their independence but also decrease their risk of cardiovascular disease," Murray says. 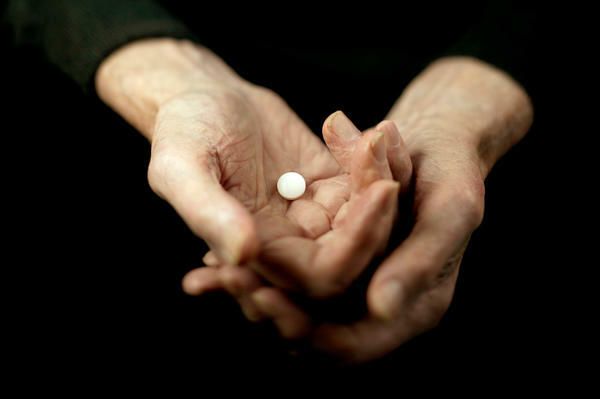 "This gives pause and a reason for older people and their physician to think carefully about the decision whether to take low-dose aspirin regularly or not," Hadley says. "And in many cases the right answer may be: Not."